Rocky was mid tantrum, nothing new there, this is everyday life for a toddler after all. 'I wish I knew' I said with a sigh, as I signed for the rather large box. I sat the box down, making a huge deal of it to try and distract him from whatever it was he decided to be angry about that day and praying it was something he could play with. This 78inch train of wonders is a masterpiece. OK, so I'm a little over excited due to the fact this is the first bit of peace I've had all day, all week, I'd even go as far as a month even. But this is the Ferrari of the In The Night Garden toy range and I honestly think it has just saved my life. Based on the Ninky Nonk Train from the ever popular Cbeebies, In the Night Garden, this toy is 5 toys rolled into one, with 14 separate features and all interlinking easily into a pull along train. With practically all the senses bar smell included, this toy has been perfectly thought out from a sensory, educational point of view and with it's thick durable plastic, it can withstand all the bumps and scrapes a toddler throws at it. The musical train is made up of 5 bright and colourful carriages, all featuring your favourite In the Night Garden characters. Ninky Nonk Musical Pull Along Engine sings out instantly recognisable Ninky Nonk train sounds, 3 Character Songs and a soothing bedtime lullaby (sounds and lights). 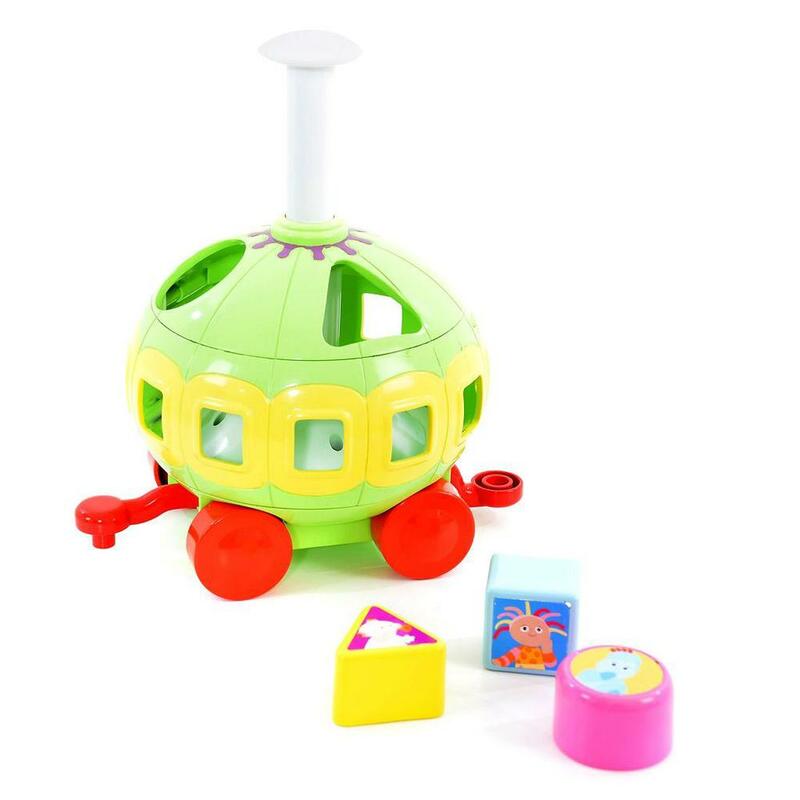 Tombliboo's Spinning Shape Sorter (Improved fine motor skills, shape and colour). Pop-up Igglepiggle and Peek-a-Boo Carriage (senses stimulation). It is no surprise to hear that in the heat of the moment, I may have kissed this box, as it arrived at such a perfect point in a tantrum BUT in the light of day, I have to say, there isn't much difference in opinion a few days on. The toy has been put through it's paces, Rocky isn't one of the World's most gentle souls, and it still looks like new. He has put it together, taken it apart, swapped features round, tried to put the wrong bits in the wrong holes and he still wants to play with it. We have found that many toys don't hold his concentration for long, he plays, works them out and then that is it, he's bored and it gets shoved to one side. Nursery have said it is a sign of intelligence so we are rolling with that. This toy has so many features that he is still playing with it 72hrs on. I am a bit shocked but very happy. He seems to like the noisy Ninky Nonk part the most, but then he's always happy if he's creating noise. He has worked out how to piece the train together now and can easily pull it along by himself, although it easily falls apart resulting in a few screams of frustration but it is easily fixed. I love that it has an off switch for the sound as that means he can still play but quietly when needed. I also like that the box comes with batteries, it is often a feature forgotten by manufacturers and I niggle most parents hate about buying new toys. Based on the Ninky Nonk Train from the popular CBeebies show, In the Night Garden.